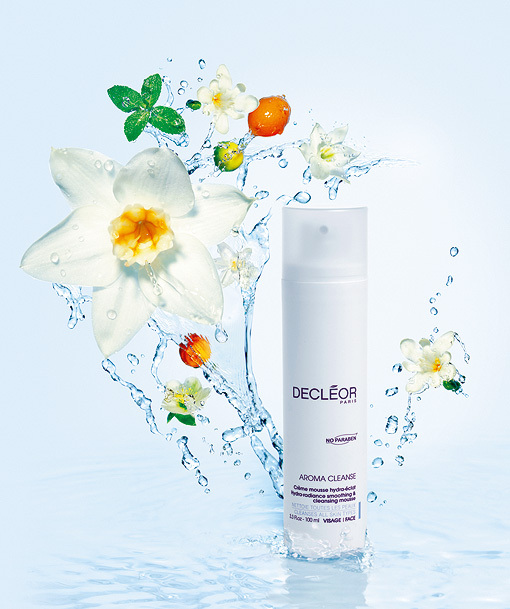 Launching exclusively to QVC at midnight on Saturday 14th August is Decléor’s latest cleansing solution. Decléor’s Aroma Cleanse (£28) is a mousse that promises to deliver well-balanced cleansing with an emphasis on skin-caring ingredients. When it comes into contact with water the rich, concentrated cream quickly lathers to a gorgeous mousse-like texture, creating tiny bubbles to swiftly deep cleanse and soften the skin leaving it clean and velvety soft. The inclusion of two cotton cloths with each pump dispenser also provides a further delicate exfoliating action and helps to ensure skin is left free of residue post-cleanse. Grapefruit, Papaya extract and Japanese White Mulberry exfoliate and gently slough away dull dead skin cells to leave the skin crystal clear with visible clarity and luminosity after just one use. With nourishing Neroli essential oil – also known for it’s decongesting and calming properties – and Hyaluronic acid, a potent protein that occurs naturally in the skin and can hold up to 1000 times it’s own weight in moisture, immediate results on the skin are outstanding. The skin has renewed plumpness due to the injection and retention of moisture, which gives it an extreme feeling of firmness, while wrinkles appear reduced and skin feels intensely soft and balanced too. Just a couple of claims to bear in mind while I’m testing the sample I received then… phew! Mostly, I’ll be concentrating on this moisturising aspect… I’m sceptical! I’ve never used a mousse or foaming cleanser (and I’ve used a lot!) that hasn’t left me RUNNING for my moisturiser as my skin tightens uncomfortably within minutes of cleansing. You’re up against it Decléor! Hmmmm…. Sounds interesting. Especially the moisturising bit. Ove recently switched to oil cleansers and LOVE the way my skin feels after. Can this compare? Keep us posted! I’ve only done one cleanse so far… and I was sat there waiting for the tight feeling to come in…. this cleanser sounds good. esp with neroli EO which is suppose to be great for the skin! I’d love to learn more about EOs and the like, you sound knowledgeable! I think Decleor are realising that people want something more from their cleansers, and with all types of balm/oil/wash/foam and this is their take on it, with a bit of moisturising qualities thrown in so as not to frighten the horses, interested to see what it is like and will probably watch at some point on Saturday. Yano, it doesn’t seem that ‘foamy’ to me at all… it’s not even really much of a mousse-type product. Seems quite creamy, I’m surprised (but so far, impressed). Weight Watchers, a typical Weight Watchery Day! FOTD - In The Pink!! Savse Smoothies for a DIY Juice Cleanse? Shopping and Spa-ing... Do you go it alone?